For years, I’ve had two framed items hung on my office wall throughout my various stints as CIO, CTO, etc. I like to think of them, both individually and together, as reflecting certain truths or ironies I encounter as a technology executive, particularly in the realm of leading others. They serve as cautions to me of leadership potentially gone awry. So let’s talk about what they show. The first is a decades-old cartoon taken from a German calendar, preserved from the years I lived in Berlin. Two animals are playing on a seesaw. One is huge and bear-like, the other a small critter like a hedgehog. As you’d expect, the bear outweighs the hedgehog, who dangles on the high end of the seesaw. 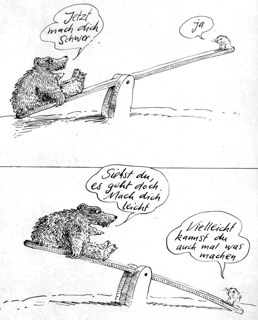 The large one says to the small one, “Now make yourself heavy.” The little one says “OK”, and voilà: the next panel shows the seesaw reversed, contrary to gravity and logic, where the hedgehog is now outweighing the bear. The second is a Sunday Doonesbury strip that I actually remember seeing when it first appeared. My wife found an online source where you can purchase these, so she bought and framed it for me a few years back. It riffs on what happens to be one of my all-time favorite songs, “Midnight Train to Georgia.” Here’s a partial view of the strip I found on Flickr. In this strip, the show is all about the lead singer. As she belts out the song under the spotlights, her backup group dances and gyrates behind her, literally “going through the motions” while smugly congratulating one other on their style, their moves, and what they see as their own inflated salary for how little they actually have to do: chiming in occasionally with a heartfelt “Woo woo.” “Beats workin’,” chortles one of them at the end. Don’t be the lead singer, taking all the limelight and remaining oblivious to what’s happening behind you. It can’t be all about you and you alone, otherwise the people you depend on will get as smug, cynical, and minimally contributing as the backup singers shown in the strip. In the German cartoon, the hedgehog (especially from its perspective) is being asked to do all the work, against long odds. In the Doonesbury strip, the backup singers aren’t being asked to do much of anything. And in the end, both the hedgehog and the backup singers are disgruntled in their own way, given how they’ve been treated. These cartoons present two parables of leadership, in essence. Of course, parables actually aren’t as useful if they’re overexplained and interpreted, so I’ll leave it here. My bottom-line advice for technology leaders for establishing how you relate to your team: find the middle ground. So, Gladys Knight should have been backed up by hedgehogs? Sorry Peter, I couldn’t resist. My kidding aside, I’ve known far too many leaders who need to have these strips framed and placed on their walls. 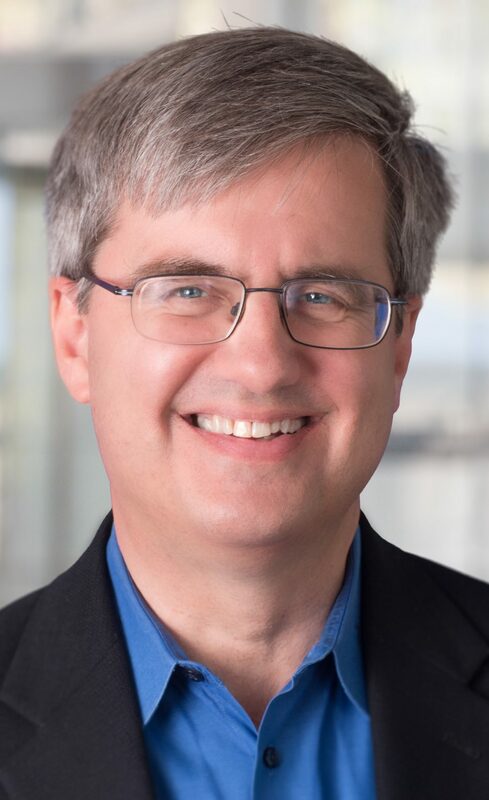 lean4it Charles T. Betz’ intelligent voice of experience: thoughts on IT value, systems thinking, DevOps, and more from a savvy, thoughtful practitioner and author. Can a CIO be successful without IT experience? Define your terms!